One important task of science and technology is to help to ensure the security of the food supply. Food security is the availability and access to food; and advances in crop science have helped to increase yields so that the supply of food is adequate for the earth’s population. With the world population growing at a significant rate, food production has become a massive global issue, and that means we need to be more careful to prevent contaminated food supply from being served. 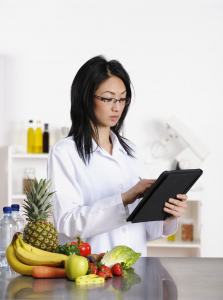 Another primary goal to which science and analytical technologies can be applied is food safety. Pure food is already a very complicated mixture of many different kinds of molecules, not to mention the potential contaminants, adulterations, and toxicelements that one hopes to measure in this overly -complex matrix. The Food and Agriculture Organization, the World Health Organization, and other government agencies are making an important effort to standardize food testing practices around the world. Depending on what analysis (microbiology, allergen, chemistry, etc.) is needed, specific technologies such as spectrometers, refractometers, titrators, moisture analyzers, etc. may be utilized. Our analysts here at SDi have been gathering information of recent industry events and surveying scientists to determine equipment use within and beyond food safety to include agriculture, beverage manufacturing, fishing and more for our 2018 Testing Before Tasting: Analytical Instrumentation for Food Applications report. In this article, we’ll take a moment to preview some of their research and highlight how companies within the analytical instrumentation industry have been striving to improve efficiencies and our ability to test for pathogens and ensure a high standard of food quality. The summer of 2017 saw many new research facilities dedicated to food safety and testing. In June, Netherlands chemical company Corbion, invested in its biobased food ingredients business with a new facility in Kansas City, Missouri. This facility will focus on bakery and meat research. AsiaInspect opened lab a in Hangzhou that houses multiple atomic spectroscopy and chromatography techniques, to conduct physical and chemical analysis for food contact product safety. MilliporeSigma closed out the summer by announcing the opening of its first global Food Safety Studio designed for manufacturers of all types of food to collaborate with MilliporeSigma on developing products for the rapid detection of food-borne pathogens. Last September, 3M Food Safety, a provider of pathogen and hygiene monitoring solutions purchased Elution Technologies (previously a Bia Diagnostics and Immunology Consultants Laboratory company). Their new Elution Tech division supplies more than 30 different lateral flow and ELISA kits for allergen testing. As lateral flow assays can easily be transported to remote sites and ambulatory care settings, they are a practical alternative for point-of-care diagnostics and allow for on-site detection of a disease outbreak, food poisoning, and more. The 2017 calendar year ended with Biotage, a separations technology firm, entering an agreement to acquire Horizon Technology for $18.4 million. Horizon Technology supplies separation systems and consumables for water purification, food safety, the petrochemical industry, biofuels, agriculture and the pharmaceutical industry, among others. With so many new regulations, facilities, collaborations, and techniques in place, food safety testing alongside biopharma drove the growth within the Mass Spec market at the beginning of 2018. Most interestingly, this April, the Government Accountability Office (GAO) issued an article on food safety that there are still many steps to take to protect everyone from arsenic consumption through rice. We also saw the introduction of many new instruments at Pittcon in February and at American Society of Mass Spectrometry (ASMS) conference in June. Alpha MOS introduced Heracles NEO, a system that improves the sensitivity of electronic nose based on a flash GC and FID detector system. QC for the food and beverage industry is the main application. Thermo Fisher introduced the TSQ 9000 Triple Quadrupole GC-MS/MS for routine high-throughput laboratory applications and improve ease of use and is particularly suitable for food labs. They also showcased the ISQ 7000 Single Quadrupole GC-MS system, designed for analysis in food, environmental and forensic labs. Analytik Jena also unveiled a new solution combining LC with ICP-MS. One application that inspired the concept is the discrimination of different elemental species with very different toxic effects, such as organic and inorganic arsenic compounds, in food samples. The system couples an LC, provided by Sykam, to Analytik Jena’s existing PlasmaQuant ICP-MS. Beyond food safety, other applications include paint in toys, and hazardous substances in other consumer products, as well as more general research. Stay tuned for our next articles in the series, which will provide some insights from the 2018 Testing Before Tasting: Analytical Instrumentation for Food Applications report. This report will cover components within the upstream and downstream processes and include end-user perspectives.